OMAFRA Field Crop Unit staff have traditionally conducted a Pre Sidedress Nitrogen Test (PSNT) survey across Ontario at the beginning of June each year to examine the natural soil nitrate available. In the past, 80-100 samples would be collected from fields across the province that had not received any preplant nitrogen other than up to 30 lbs of N banded at planting. In 2016, we are transitioning to reporting the results of the GFO supported Soil Nitrogen Sentinel project (http://bit.ly/1WMzSb4). The goal of the project is to collect samples over time from several permanent sentinel locations to better understand how natural soil nitrate levels change over the spring. Soil organic N mineralizes over time in the spring at different rates due to temperature, moisture, soil texture, crop rotation among other factors. Soil samples were collected from 23 locations beginning at planting time (~May 1), through the V1-V2, V3-V4, crop stages with additional sampling events planned for the V6 and V9 stages where “V” designates visible collars on the corn plant. The V3-V4 sample timing coincides with the historical annual PSNT survey, and together with data from an additional 12 supplementary sites is included in this years survey. Ongoing results for the Nitrogen Sentinel project are available at http://bit.ly/1rd6z3F. In general, the spring of 2016 has been cooler and drier than average through April and May, although accumulated CHU’s have caught up to above normal as of the last week of May. While cooler and drier conditions may reduce nitrogen mineralization from organic sources (supply) in the soil, the drier conditions reduce the potential for loss through leaching or denitrification. A total of 35 samples were collected from June 6 to June 7 in corn generally in the V3-V4 stage from locations scattered throughout Southern Ontario, as well as a few in central and eastern Ontario. With an overall average of 11.2 ppm in 2016, soil nitrate levels tended to be average or slightly above average relative to the 5 previous survey years (2011-2015), while slightly lower than 2015 values which were well above normal (Figure 1). Figure 1. PSNT survey results by soil texture for years 2011-2016. PSNT values were similar on fine and medium textured soils (Table 1), but lower on coarse textured soils, which is generally consistent with N credits and past PSNT surveys. When summarized by previous crop, soil nitrate values were similar for corn following cereals (predominantly wheat) or soybeans, but lower when following corn, again consistent with N credits (Table 2). 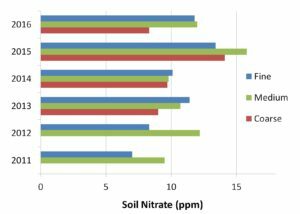 In general, soil nitrate values are similar to average, suggesting normal nitrogen practices should be adequate for these sites this year. However, these values are a relative indication only, and should not be used as a recommendation for nitrogen rates on any given farm. Soil nitrate values are highly influenced by the environment (agronomic practices, local weather). For instance, if you are in an area which has received significantly more rainfall than other parts of the province, you may have also experienced more loss than is reflected in these results. The only way to know soil nitrate concentrations on your own farm is to pull soil nitrates from your own fields. To collect PSNT samples, collect several 12″ soil samples across a field using a soil probe. Sample parts of fields differently if there is reason to suspect differences in N content (past history, soil type, topography etc.). Take a well-mixed representative sub sample of approximately 1 lb to fill a lab box or bag. Samples should be chilled to prevent further mineralization and sent to a lab as soon as possible. PSNT recommendations for a given soil nitrate test are only valid for natural soil nitrate supply, not valid where any nitrogen fertilizer would be collected in the sample (preplant, broadcast N). A modest amount of N applied with starter (ie. 30 lb/ac) is OK provided sampling can be taken mid-row to avoid these bands. OMAFRA has recently revised PSNT recommendations to include both a soil nitrate measurement and an expected yield that can be achieved (Table 3). Thanks to our N-Sentinel trial co-operators, as well as Greg Stewart, Maizex Seeds for providing supplementary nitrate samples for the 2016 PSNT Survey.